Core Faculty: Jackie Lelkes (Social Worker), Tracy Szekely (OT), Pam Trangmar (PA). Guest Faculty: Dr Ruth Hartley. Poem by Molly Case, a nurse and poet, who was commissioned to write a poem called Last 1000 days by NHS England – links in with this episode and also end PJ paralysis. To understand that not every patient will want to have this discussion but many will value the time hugely. National End of Life Care Programme, Advance Care Planning: a guide for health and social care staff. February 2007) – Nice report with a really good introduction. A process of planning for the future so that your patient gets the care that they want for their healthcare as they age, and not a one off thing – more of a process over time. 1. Introduction – What is an ACP? Advance Care Plan – Explain this is the episode! The Department of Health End of Life Care Strategy – is a series of reports highlighting best practice. In particular it highlights the role of ACPs to ensure patients wishes are respected / met at the end of life. In 2008 the UK End of Life Care Strategy called for open discussions between healthcare professionals and patients approaching the end of their lives as the first step to ensure well-planned care is delivered. It recognised these discussions have many different forms, may be initiated in a broad range of circumstances and should not be the remit of one professional group alone. Backed up by a study of social workers that suggests that there is a consensus among social workers that advance care planning is their duty and responsibility and that social workers play an important role in promoting and implementing advance care planning through an array of activities. Your health is good / great now, but have you thought about what might happen if anything should change? This is a really good starting question. 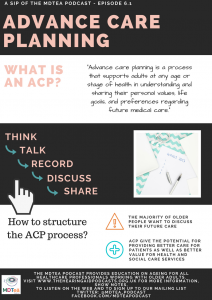 When should you start an ACP? Advance care planning may be instigated by either an individual or a care provider at any time. Most (60-90%) of older people wanted the discussion and would like it sooner rather than later. BUT… not everyone wants the discussion. Doctors however see the need to discussion when people have an illness but less so when older people are in good health. An illness trajectory denotes the change over time in level of physical ability or functioning as a result of the illness. It is sometimes useful to think in these terms with regard to planning for the future. Three distinct illness trajectories have so far been described for people with progressive chronic illnesses. This illness trajectory is of a slow decline, followed by a fairly rapid decline in function towards the end of life. During the last months of life there is often weight loss, a reduction in performance status and an impaired ability for self care. They may be ill for many months or years, with sudden acute deteriorations generally requiring admission to hospital for intensive active treatment (as in June’s case). Patients usually survive many of these episodes. These result in a gradual deterioration in health and performance status. An acute episode may result in death. Patients with end stage heart failure follow a similar trajectory. The pathway of trajectory type three is that of a prolonged gradual decline with progressive disability. Death may occur after an acute event. Dementia and generalised frailty are two conditions which follow this trajectory. Debilitating neurological diseases, such as motor neurone disease and multiple sclerosis, may also follow this trajectory. Objective: to explore views on advance care planning in care homes for older people. Design: qualitative exploration of views from care home staff and the family of residents in care homes for older people. Setting: all care homes for the elderly in two London Boroughs. Participants: staff (care managers, nurses and care assistants), community nurses and families. Results: themes of the analysis: (i) Benefits: staff and family revealed positive opinions towards advance care planning. Staff felt it provided choice for residents and encouraged better planning. (ii) Barriers: staff and families perceived residents as reluctant to discuss advance care planning. Some care assistants were reluctant to be involved. Furthermore, families and staff reported prevalence of dementia among residents as another barrier. Nurses and care managers identified both family involvement and unforeseen medical circumstances as problematic. (iii) Facilitators: (a) early initiation of discussions (b) family involvement to establish preferences (c) residents and staff being well-known to each other and (d) staff training, were perceived to facilitate ACP. Overall, staff and families support the concept of ACP. Methods to overcome the identified barriers are required to embed ACP within end of life care in care homes. This second study looks at anticipatory care plans and if they lead to reduced hospital admissions. They describe an anticipatory care plan as: A process of discussion between a patient and a professional carer, which sometimes includes family and friends. Identified patients from 10,000 in a GP register using a case finding tool (high risk for admission). Initial interview with the patient went through the following questions coupled to a change in care after this. Carer or cared-for status — how was immediate care provided for the patient? Acute medical illness — patient’s understanding of their condition. Acute surgical illness — patient’s understanding of possible diagnosis. Illness trajectory — patient’s understanding of the likely course of their illness. Preferred place of care — in the event of deterioration, patient’s preferred care venue. Resuscitation status — patient’s wishes for resuscitation to be attempted. This approach produced statistically significant reductions in unplanned hospitalisation for a cohort of patients with multiple morbidities. It demonstrates the potential for providing better care for patients as well as better value for health and social care services. It is of particular benefit in managing end-of-life care. The Care Quality Commission (CQC) have identified that people living with dementia are one of the ‘groups in society who experience poorer quality care at the end of their lives than others because providers and commissioners do not always understand or fully consider their specific needs’. Ensuring people living with dementia have opportunities to create an ACP as early as possible following diagnosis will assist in reducing this inequality. gradually lose their ability to make informed decisions themselves, ACP still only happens infrequently, and evidence-based recommendations on when and how to perform this complex process are lacking. Principles of ACP in persons with dementia is similar to those we have discussed above and this is a good guide to the process. An ACP conversation encompasses preferences and wishes for living and dying well. A personalised care and support planning conversation should already have taken place prior to exploring ACP. It is important to emphasise that the opportunity for ACP should always be offered. preconditions for optimal implementation of ACP. Almost all recommendations received a grading representing low to very low-quality evidence. there is limited evidence for the effectiveness of ACP in people with cognitive impairment/dementia in terms of ACP documentation and health-care use. In terms of capacity to discuss ACP, nursing home settings may be too late for people with dementia. is an inclusive, personalised, proactive and transparent process that cuts across health, social and community care settings. It focuses on what matters most to the person; so that they are involved in decisions about their health and wellbeing, and are more in control of living their life with their conditions. ensure people living with dementia have the same equal opportunities as those diagnosed with other life limiting conditions / diseases, in terms of accessing palliative care services / support. Are you the right person to do advance care planning? Do you understand the basic principles of advance care planning? Do you have a good understanding of the individual’s condition, treatment options and prognosis? Do you have knowledge of local resources? Are you currently influenced by any other factor such as professional, organisational or family pressure? Barriers and facilitators to having an ACP discussion with patients. …Based on the findings, we suggest strategies for both healthcare systems and individual healthcare providers to improve the quality and quantity of ACP with this population. These include assessing readiness for participation in ACP and personalising relevance of ACP to each individual, routinely offering scheduled family meetings for exploring a person’s own goals and sharing information, ensuring systems and policies are in place to access previous ACP documentation and ensuring doctors’ education includes ACP communication skills. Doing the ACP is one part of a process – the results need to be communicated to a range of HCPs who may work with the patient… this can be complex. We will talk through some examples of these in the show. The AMBER care bundle is a communication and planning tool that supports a systematic approach for clinical teams to proactively manage the care of hospital patients who are facing an uncertain recovery and who are at risk of dying despite treatment. “Uncertain recovery” means that your patient is being actively treated for an acute problem but may not recover, due to limited reversibility caused by an underlying illness. Any member of the clinical multi-disciplinary team can identify patients suitable for the AMBER care bundle. Gold Standard Framework – working to coordinate care at the end of life – excellent website with a good range of training resources.